Crescent University, Abeokuta has graduated a total of 141 from three colleges at its 5thconvocation. The university was founded by the former world court judge, His Excellency Prince Bola Ajibola in 2005. Four important personalities were also given honorary doctorate degrees in recognition of their social service. They are Chairman Honeywell Group, Chief Oba Otudeko, Eminent Islamic Scholar, Sheikh Ahmed Lemu, Consummate Accountant, Molade Okoya-Thomas and business mogul, Alhaji Abdul Samad Rabiu. They were honoured with Doctor of Science (DSc) in Banking and Finance, Public Administration, Accounting and Business Administration respectively. Eight graduated with first-class honours, fifty-five finished with second class upper, fifty four with second-class lower and twenty-three with third-class from College of Information and Communication Technology(CICOT), College of Natural and Applied Sciences(CONAS) and College of Social and Management Sciences(COSMAS) of the university. He praised the graduands for working hard on the sacrifice of their parents and guardians, noting that he was pleased as a proud father to share the great moment with their parents, guardians and mentors “who have provided support that allowed you to reach this milestone”. Okeleye said the university was proud to release the graduating students to the world as its ambassadors flying its flag. In his acceptance speech on behalf of other honourees, Chief Oba Otudeko lauded the proprietor, Judge Bola Ajibola describing him as being blessed because Crescent University was a dream fulfilled. 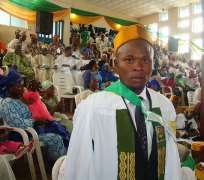 The best graduating student Fatai Abolade Adelekan from department of Economics with Operations Research scored a total of 4.82 Cumulative Grade Points (CGP) to lead other 140 graduands. Clinching three prizes (vice chancellor's best graduating prize, college prize and departmental prize), Oyelekan attributed his success to a charge by one of his teachers in his secondary school days that he must get serious with his studies to be the best. He added that he was most motivated by the huge amount of money that was being paid as school fees yearly. “ I cannot just afford to watch them go down the drain”, he has said. A CROSS SECTION OF GRADUATING STUDENTS FOLLOWING THE PROGRAMME.